delicious wife: wanna see me parading in a swimsuit? wanna see me parading in a swimsuit? 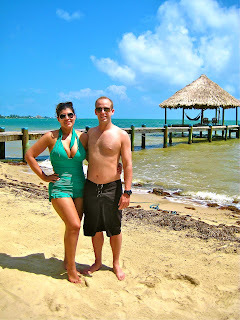 so, i've just returned from Belize! let me start by saying it was fabulous! now, i'm gonna be a little showy and little sappy. the thought of spending 5 days in a swimsuit gave me anxiety, i'm not gonna lie. so, the diet, leading up to the day we left, was tough and absolutely necessary! i managed to stick to it. of course, i had a few slip-ups. and, when i say slip-ups, i mean i had 31 grams of carbs instead of 20.
day 1 was easy. it's always easy in the beginning, right? around day 30 i buckled down with steady fat loss as the definite motivator. around day 50, i was ready to give up. the scale didn't budge, and my measurements weren't shrinking. regardless, i kept my eyes on the prize. for the first time in my life, i was comfortable in my swimsuit...heck, i was comfortable in my body. i didn't care how i looked, because i felt amazing! in life, i've been thinner, but i've never been happier! i realize the diet changed my body. but, it's my self-confidence that has transformed the most. i feel healthy and strong. and most of all, i am happy. and, my happiness has very little to do with my body. okay, that's kind of a lie. it has lots to do with my body. but, it has mostly to do with my life. you see, we all have a story of how it happened. you know, how we got fat. for some of us it's the ups and for some of us it's the downs and for some of us it's both the ups and downs. when i decided i was done with the yo-yo diet, i also was done with the yo-yo life. it wasn't very long ago when i was not only unhealthy but unhappy. i had enough...i wasn't going to let the world around me determine how i was going to live my life. sure, i can't control the trials and tribulations that are thrown my way. but, i can control how i navigate through them. having lived a very, shall i call it, colorful life, i can only be so grateful to have experienced so much, but even more grateful to have learned so much. and, if all of it was the price to pay to get here, this place of pure bliss and honest love, it was well worth it. my point is, it wasn't weight loss that brought me happiness. but in fact, quite the opposite! before you shed the weight, you've got to shed the insecurities, the guilt, the shame. to make it last, you've got to shed the past. after 5 fabulous days of beautiful beaches, endless enchiladas and pina coladas, not to mention the stacks fry jacks, i'm home. and, there's no place in the world i'd rather be then right here with my family. Your Absoultely beautiful and no I'm not saying that because your my cousin. You just are. thank you, texaswinemaker! it really means a lot! you, your hot cpa wife, and super cool kids are an inspiration!